We are obviously getting more and more into our local and home-grown produce, and I love the point in every year as we plan what we will grow in our garden. 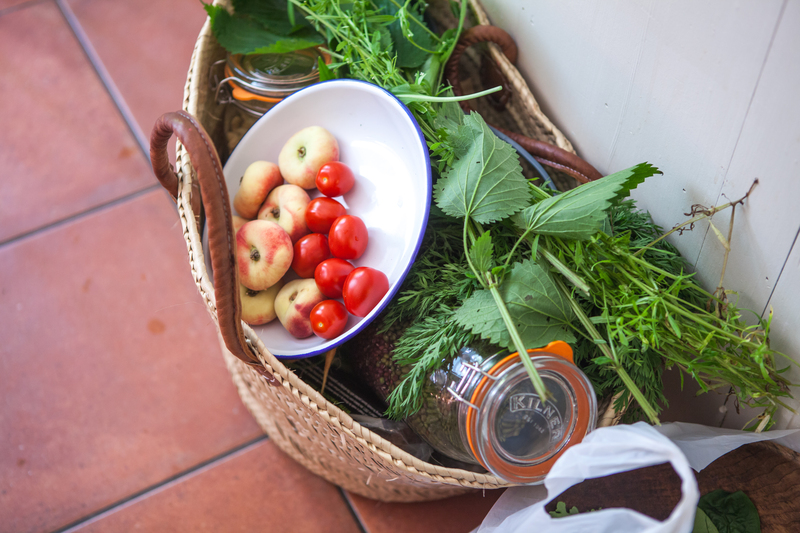 Providing, growing and picking your own food feels like such an important thing in this age of mass consumerism and the amount of waste we’re seeing in supermarkets. During the winter, it is harder to be somewhat self-sufficient, but as spring and summer descend, it’s a real privilege to be able to eat what we have grown. With such a wealth of natural plants around us, especially in the wonderful local woods, I’m keen that we can start foraging a little more for wild plants, flowers and berries – in part to make use of the nature that is around us, and also because part of the reason for moving out of the city was to give our children a better connection to the natural environment and a better understanding of where food comes from. To make sure we didn’t end up cooking up a dish of poisonous mushrooms and deadly nightshade, I turned to the impossibly beautiful and healthy-looking Primrose, from Primrose’s Kitchen (she makes 100 per cent natural raw vegetable muesli, with flavours like raw beetroot and ginger) at her home in Dorset, and has recently expanded her range to include nut and seed butters, healthy sprinkles, granola and smoothie busters. Between March and July, you shouldn’t need to buy bulb garlic when you have this growing near you. It likes damp ground so you will find it in woodlands and near streams or rivers. Often you will smell its garlicky aroma before you see its white flowers. You can identify wild garlic by its pointed green leaves on a single stem and six white petal delicate flowers. You can eat the leaves and the flowers so just cut with a small knife. Wild garlic can be used in the same way garlic bulbs are used such as being added to stews, soups, pestos and salad dressing. The flowers can be added to salads as decoration. 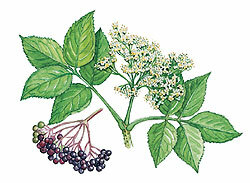 The elder tree can be found in woodland, scrub, hedgerows and on wasteland. Superstition said if you planted one outside your house it would keep the devil away. You can identify it by its feather-like leaves, which smell bad when touched. It flowers from mid-May to July, these are large flat umbels about 10-30cm across and have a creamy colour and high scent. The flowers and berries are mildly poisonous raw so need cooking before eating. Pick the flowers when they are fresh and a pure creamy colour and show no browning. Like the berries which we get later in the year the flowers can be dried for use in a tea that wards off colds, flu and bronchial complaints as well as of course using fresh for cordial, champagne or flavouring ice creams and sorbets. Known as ‘goose grass’, cleavers is recognizable by its straggling stems, which branch out across your path and the way it attaches itself to you with small hooked hairs. It often grows beside nettles in damper and more shaded woodland areas or near streams. Nettles release formic acid from their hairs when you brush past them causing a stinging sensation. Their leaves are egg-shaped with pointed tips and a serrated edge. Both of these can be dried and combined to create a tea that will support the liver, kidneys and lymph for removing toxins from the body. Cleansing herbs like this are good to use whilst the moon is on the wane as it supports the process of removing wastes from the body. Learn to use all of your sense for identifying plants; don’t rely on visual identification alone. Often deadly plants are foul smelling, although not a general rule! Top Tip: Consider cultivating wild edible plants in your garden. 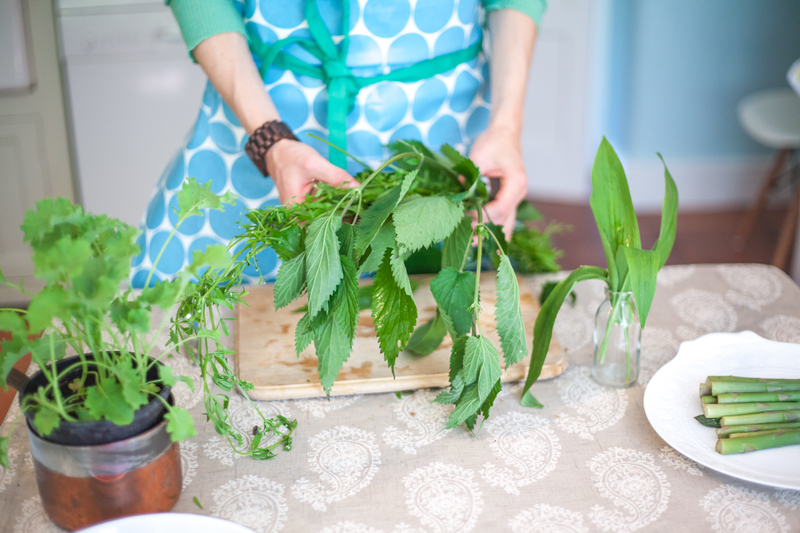 Often called weeds, a lot of wild plants are easy to propagate. More information on Primrose’s Kitchen here.